The Long-eared Owl - Asio otus (previously: Stix otus) is a species of owl which breeds in Europe, Asia, and North America. This species is a part of the larger grouping of owls known as typical owls, family Strigidae, which contains most species of owl. The other grouping of owls are the barn owls, family Tytonidae. This nocturnal (active at night) species is perhaps most easily seen perched in a tree in its daytime roost, sometimes in small groups during the winter months. The Long-eared Owl is a medium sized owl, 31-37 cm in length with an 86-98 cm wingspan. It has erect blackish ear-tufts, which are positioned in the center of the head. 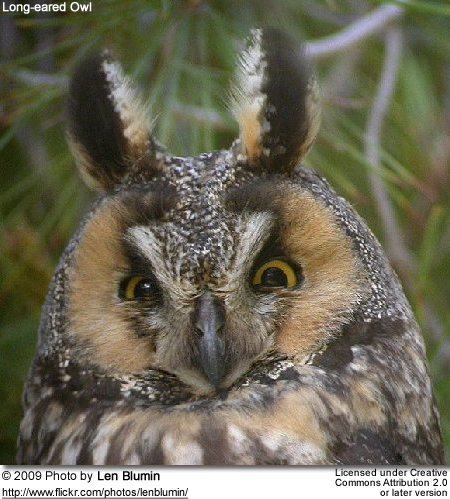 The ear-tufts are used to make the owl appear larger to other owls while perched. The female is larger in size and darker in coloration than the male. The Long-eared Owl’s brownish feathers are vertically streaked. Tarsus and toes are entirely feathered. Eye disks are also characteristic in this species. 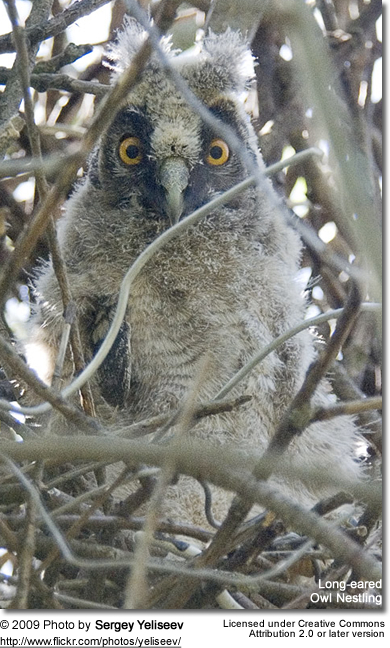 However, the eye disks of A. otus are darker in color or rusty-orange. 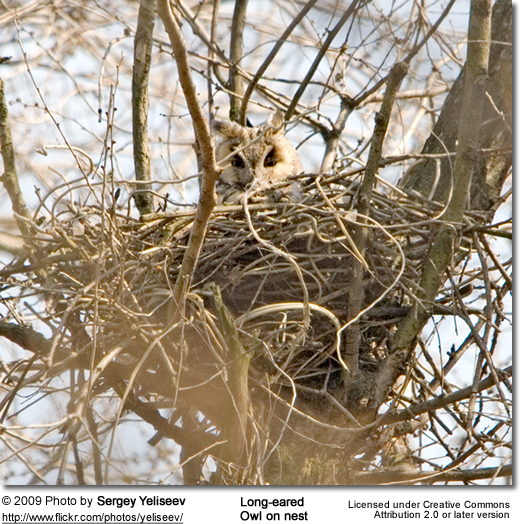 The Long-eared Owl's breeding season is from February to July. This bird is partially migratory, moving south in winter from the northern parts of its temperate range. Its habitat is forest close to open country. It nests in trees, often coniferous, using the old stick nests of other birds such as crows, ravens and magpies (Family Corvidae) and various hawks. The average clutch size is 4-6 eggs, and the incubation time averages from 25–30 days. It will readily use artificial nesting baskets. An unusual characteristic of this species is its communal nesting in thickets during the winter months. The Long-eared Owl hunts over open country by night. It is very long winged, like the similar Short-eared Owl, and glides slowly on stiff wings when hunting. Its food is mainly rodents, small mammals, and birds.